Fireplace Finishes and Code Compliance- Armchair Builder :: Blog :: Build, renovate, & repair your own home. Save money as an owner builder. A fireplace is great for comfort on cold winter nights. In addition to heating up a room, the design of the surround can create a really nice focal point in any room. But if you’re not careful, the fire can spread out to the living area of the room. For this reason, it’s important to do some planning before building new or altering your existing unit. Here we discuss the building codes that will affect your fireplace finishes. Be sure to watch our latest video at the bottom of the page on the proper measurements for mantels, hearths and trim. The centuries old design behind the fireplace was to send heat out into the living area while keeping the flames contained inside the fire box. In order to achieve this, we need to keep all combustible materials a safe distance away from the extreme heat and flames. For this reason, the fireplace finishes most commonly used up next to the fireplace opening include stone, brick, granite, marble, tile or similar, non-combustible materials. These are attractive and can withstand extreme temperatures. Where it gets a little tricky is when the homeowner wants to install a wood mantel or wood surround. These common fireplace finishes can really enhance the look with minimal extra costs. However, we need to be sure to install them a safe distance from the fireplace opening. In addition, flooring can create a fire hazard when installed too close to the fireplace opening. Carpet and hardwoods can catch fire when embers pop out from the box. In order to prevent potential problems, every hearth needs to project out in front and to the sides of the opening. Fireplaces today typically come in one of two forms. A masonry fireplace is built on site and made up of solid masonry blocks or hollow unit masonry grouted or cement. On the other hand, factory built fireplaces are manufactured and listed and labeled with Underwriters Laboratories (UL). The factory models are to be installed strictly per the manufacturers recommendations. 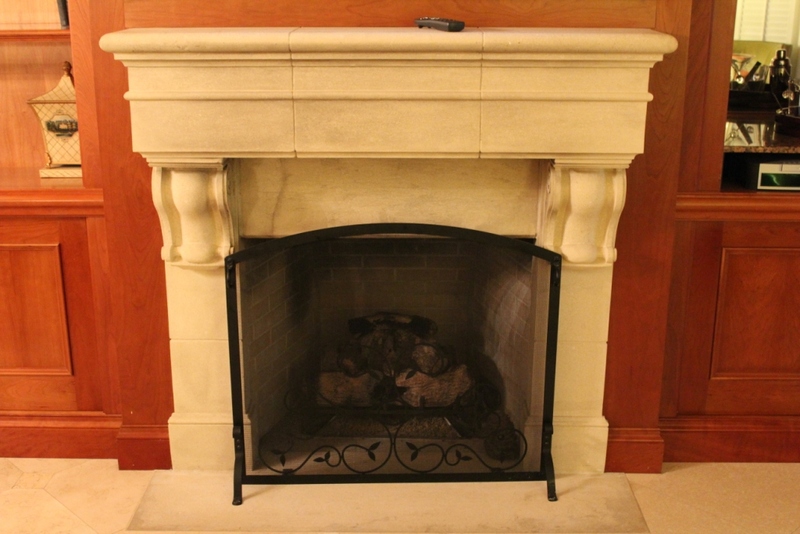 Each type of fireplace has specific building codes that apply to each. Unfortunately, each municipality has the ability to choose what codes are enforced. I recommend you put a call into your local building department to get specific guidance before building or altering your fireplace. The video below dives deeper into the more common requirements for the typical fireplace finishes.